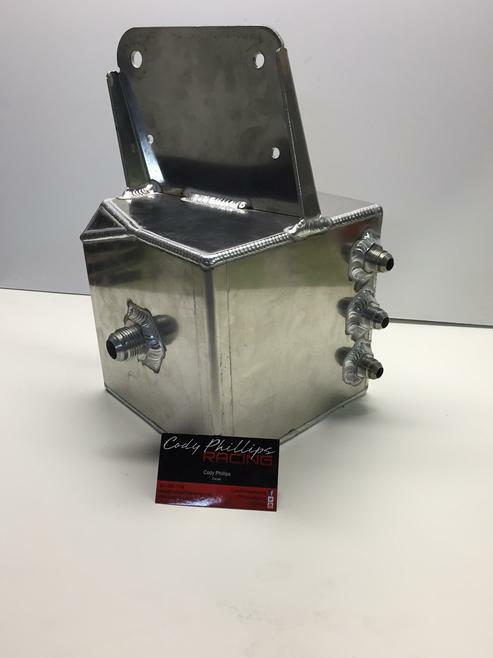 The CPR Surge Tank is geared toward those that are running a big external fuel pump such as a Weldon. This is a must have for street, drag, and road race applications. The idea of modifying/drilling your OEM fuel tank doesn’t sit well with most. And sealing it is a PITA. Most have settled for a pickup suction tube from the top of the OEM hanger to feed the Weldon. The problem with that is after about 1/2 tank the pump begins to cavitate from sucking air. With the CPR surge tank you will be able to run a OEM type of fuel pump to feed the surge tank from your main fuel tank. This gives you the ability to use ALL of the fuel out of the OEM tank with your external pump. The surge tank is fitted with three -8AN fittings to suit your needs. One is used as feed from the OEM tank. One is used for the overflow return back to the OEM tank. One is used as an option to return your main return line from your FPR to the surge tank. If you choose to keep your current return line you can simply cap the third -8 fitting. The tank mounts in the rear of the Supra using OEM bolt holes and two optional mounting tabs if you wish. The bottom of the tank is fitted with a -12 AN line to feed your external fuel pump.